We spend a good deal of our lives trying to hide our weaknesses. Entire industries are built on this idea. The whole makeup industry, (or whatever it is called, all the gook people put on) is designed to cover up our natural flaws, our imperfections and signs of aging. In other, older, societies, those "flaws" are signs of individuality, and "imperfections" that develop over time are signs of the life we have lived and the experiences we have gained, both good and bad. Our scars, our wear and tear, are part of who we have grown to become. But in modern society we try to cover up everything. Whatever is seen as a sign of imperfection or weakness is covered up and hidden. I love reading the Torah, the Bible. The stories never grow old. Nothing is hidden and nothing is covered up. Family feuds, jealousy, sexual desire, rivalries...it is all there. Even the greatest of men are presented with their weaknesses, David, Samson, Jacob, all great men, all had weaknesses, and the Bible records them for all eternity. It is for us to learn. We too are imperfect, all of us. For no man has ever been created perfect and as the Bible says there is no man who shall never do wrong. We all make mistakes, we all have weaknesses, and there are no exceptions. "כִּי אָדָם אֵין צַדִּיק בָּאָרֶץ, אֲשֶׁר יַעֲשֶׂה טּוֹב וְלֹא יֶחֱטָא"
As it says in Ecclesiastics, There is no man so righteous that he will always do good and never transgress. I see the modern world of advertising as an attempt to cover up, to hide our weakness, and it occurred to me that IKI Krav Maga is the exact opposite. We are here to expose our weakness because only by seeing the truth can we build truthfully.We build upon an honest foundation, not upon illusions. Imagine a teacher asks about the level of English in a class. Everyone says they are level 4. So the teacher begins with level 5. But in fact they are all level 2, beginners. So the teacher is building on a false premise and the students do not have the foundation to understand level 5. Better to be truthful and start where you truly are. When I registered at Baruch College I asked to receive no credit for any other college courses I had taken ( I gave up quite a few credits that could have shortened my stay at university). I said - Assume I know nothing, start me at the beginning. I want to learn the basics, the foundations. Lee and Tim from Tennessee training at IKI center in Georgia. With Krav Maga if I assume to have a certain speed, power of learning quickly, strength, ability to see the future and anticipate the attacks, well, I am basically creating a movie character, not a real person. Building upon what we wish we had rather than on what we actually have, can only lead to disaster should a real situation actually arise. The truth is a bitter pill. The mirror can scare us. An athlete trains to be at his best. He will only compete when he is ready. He builds on his strengths. He will retire when he is no longer at his peak. 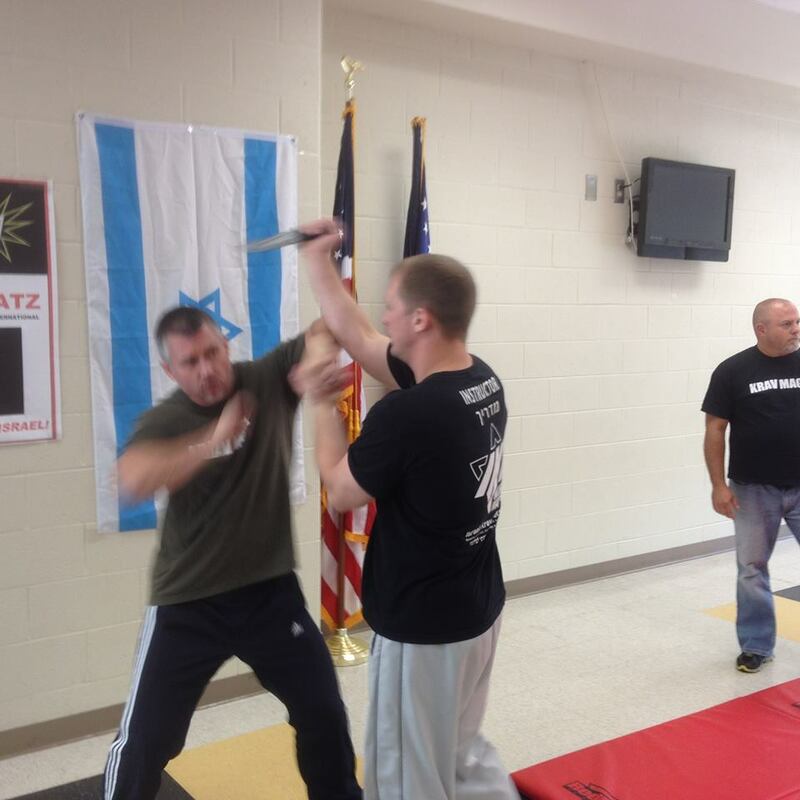 With IKI Krav Maga we build on our weaknesses, and we train for life. We assume that an attack will be difficult to predict, we will be caught by surprise to some extent. We assume this vulnerability and train accordingly. We do not train as if we know what is coming but we use the surprise to our advantage. We do not train to be supermen. We assume we will be afraid, caught off guard, we may have some physical limitations. We take all those into account with our training. Building on our weakness means training realistically. We do what we can do based on our abilities. We certainly train to improve our abilities but we never lose track of what we can actually do. If kicking to the head or flipping a person in the air are not realistic possibilities for you, we shall not do it. We shall focus on what you can do, we keep it simple and effective and within the realistic range of your abilities. We begin by exposing our weakness; physical, mental and emotional. We recognize our physical shortcomings, we recognize our limited ability to absorb new and complex techniques, we recognize our trauma and fear. Our style, IKI Krav Maga, is based on all these weaknesses. Hiding our weakness is counter productive. Exposing our weakness is our true strength. We begin from weakness and develop it into our strength.